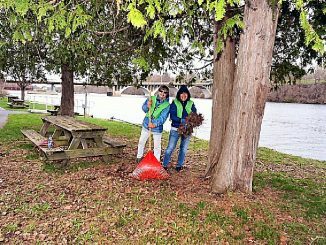 OSWEGO – “Learning is a lifelong endeavor,” or so the saying goes, and residents at St. Francis Commons in Oswego are proving this to be true! A dedicated group has begun taking piano lessons from an equally committed college student who is providing individualized music instruction to her pupils. 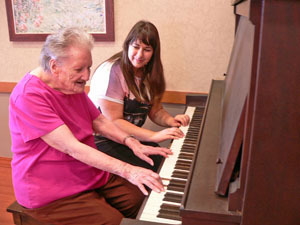 Pictured (left to right) is Ruth Waldron, during one of her piano lessons with SUNY Oswego senior Juliana Rouhana, who is completing an internship this fall semester at St. Francis Commons Assisted Living Residence in Oswego. Rouhana is working one-on-one with residents teaching both piano lessons and basic navigation skills instruction on the computer. Senior Juliana Rouhana, a Human Development Major at SUNY Oswego who is completing an internship at the assisted living residence this semester, found a number of residents who shared her interest in music and decided to help turn that interest into a new talent. Twice a week she spends time with each of her “resident pupils” at the Chautauqua upright piano located in the dining room, offering one-on-one instruction, playing together and giving each a chance to have the experience of learning something new! For her part, Rouhana has enjoyed the experience. “I’ve had a great time working with the residents! They have been eager to learn something new, and seem to really enjoy the process of making music,” she said. When not giving piano lessons she can be found at a computer, teaching residents how to navigate the technology. And how have the piano lessons been going? Just ask resident Ruth Waldron. “Playing the piano is something I never had the opportunity to do before I met Juliana. I can now play a few cords and am looking forward to learning more,” she said. St. Francis Commons is a part of The St. Luke Family of Caring, an affiliation of community-based, not-for-profit healthcare providers serving the greater Oswego County area. Affiliates include St. Luke Health Services, Bishop’s Commons Enriched Living Residence and St. Francis Commons Assisted Living Residence in Oswego, and Michaud Residential Health Services in Fulton. Together they provide care and services to more than 400 people each day, and employ more than 500 in the community.